Arsenal moves up to fourth place in the Premier League standings following their 2-0 victory against Manchester United at the Emirates Stadium. The Gunners maintained a high level of performance to deliver a much-needed win for their ninth consecutive Premier League home success. Granit Xhaka opened the scoring early with a swerving shot inside the 12-minute mark to force an uncharacteristic goalkeeping error from David de Gea. 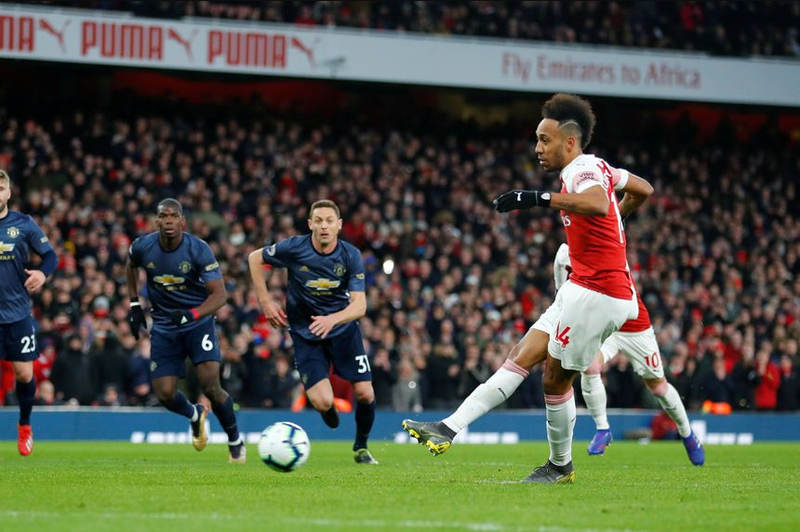 In addition, Piere-Emerick Aubameyang’s penalty in the second half made sure of the triumph to leapfrog Manchester United into the table standings and move to within a point of third-place Tottenham Hotspur. With that being said, the top-four race in the Premier League intensifies with just eight games left to play and consistency is very important. Moving forward, Arsenal coach Unai Emery is very proud of his team and he hopes that the Gunners will take confidence from the 2-0 win into their next football match. “We are happy today and we are better in the table after this result, but Chelsea are with us, United are with us and Tottenham also are with us. The last matches are all difficult matches. Being consistent is very important. At the moment, I think we are playing with confidence each match and today we showed everybody that. We must be calm, be patient, continue improving and we know, like on Thursday, one match can change a lot with one red card, one goal. Controlling emotion is very important. On the contrary, Ole Gunnar Solskjaer suffered his first league defeat as the club’s interim boss but we all know that one loss against one of the top teams won’t damage their reputation too much given the fact that they made a fine impression and a good game over Arsenal. In fact, they created some great chances from Romelu Lukaku, Paul Pogba, Marcus Rashford, and Luke Shaw however it did not take them in their 2-0 defeat to Emery’s men. What’s next for both teams? The Arsenal will host Rennes in the second leg of the Europa League Round of 16 and will try to overturn a first-leg defeat to reach the quarter-finals. Meanwhile, the Red Devils will travel to face Wolverhampton Wanderers on Sunday, March 17 in the FA Cup. Sign Up now to enjoy the exclusive and luxurious bonus rewards you deserve. This can’t be missed! Stay tuned for the forthcoming events, predictions and betting tips on 12BET, the leading online sports betting and forecasting website that allows you to bet in complete security while benefiting from best bonuses and promotions.